Autonomy. Until the 21st century, it almost always referred to humans, either through individual freedoms or regional/national self-governance, sovereignty, independence, and freedom. Today, however, autonomy is more likely to raise images of robots, self-driving vehicles, unmanned aerial vehicles (UAVs), and, more recently, their unmanned ground (UGV), water surface (USV), underwater (UUV), and even space counterparts. For DARPA, autonomy is a context-specific descriptor that can vary by domain, according to Timothy Chung, a program manager in the agency’s Tactical Technology Office (TTO), where he focuses on autonomous systems. “For terrestrial robot systems, working in structured environments, even dynamic ones like streets, we’re starting to see a maturation, because we have the compute power, different sensing modalities, GPS, and a lot of data to help inform the autonomous behaviors. That also applies to the air, which, despite being 3-D, has fewer obstacles,” he said. With the ocean, there are environmental challenges, whether surface or subsurface, for getting air- or terrestrial-grade autonomy into those environments. Building on early and dramatic successes of UAV technologies in Operation Desert Storm and their deployment as essential elements of U.S. and coalition operations in Iraq and Afghanistan a decade later, the agency has continued to push UAV technologies forward. At the same time, the commercial and industrial R&D sectors have been building up their own momentum in the UAV space to generate the current worldwide explosion of personal and commercial UAVs. Pervasive as unmanned systems have become, however, the vast majority of them remain connected to a human being with a joystick, even if that human is safely operating the system from continents away. This connection of one unmanned system to one (and usually more than one) human operator places constraints upon the system, limiting the effectiveness of unmanned systems and increasing operational costs. “The No. 1 manning problem in our Air Force is manning our unmanned platforms,” Gen. Philip Breedlove said in November 2011, when he was leading the Air Force’s operations, plans, and requirements directorate. The Air Force estimated at the time that each operational MQ-1 Predator required a crew of about 168 personnel, the MQ-9 Reaper approximately 180, and the RQ-4 Global Hawk some 300 people. One of DARPA’s newest programs – the Collaborative Operations in Denied Environment (CODE) program – is designed to extend the capability of the U.S. military’s existing UAVs to conduct long-distance engagements of highly mobile ground and maritime targets in contested, denied, and constantly changing battlespaces. If the program proves successful, the resulting collaborative autonomy technology could enable groups of unmanned aircraft to work together under a single person’s supervision rather than through the current system of continuous control by a pilot and sensor operator, each supported by numerous analysts. UAS could navigate to their destinations, find, track, and identify targets, and then present recommendations for coordinated actions to a mission supervisor, who would approve or disapprove such team actions and direct any mission changes from hundreds or even thousands of miles away. 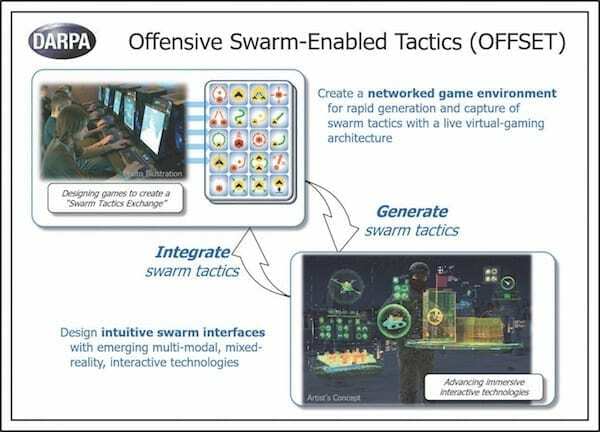 Meanwhile, DARPA’s OFFensive Swarm-Enabled Tactics (OFFSET) program focuses on the future ability of small infantry units to deploy swarms of 250 or more mini- or micro-UAVs and/or UGVs to help accomplish diverse missions in complex urban environments. Contracts to deliver on the pro- gram’s Phase 1 challenges – to design, develop, and demonstrate a swarm system architecture to advance the innovation, interaction, and integration of novel swarm tactics – were awarded in February 2018 to Raytheon BBN and Northrop Grumman Mission Systems. The Assured Autonomy Program, a new research effort that builds on recent breakthroughs in autonomous cyber systems and formal methods (reliable and telling mathematical models of complex systems), aims to advance how computing systems can learn and evolve to better manage variations in the environment and enhance the predictability of autonomous systems, such as driverless vehicles and UAVs. The Gremlins program aims to build UAVs that can carry 60-pound payloads up to 300 nautical miles and be launched from and recovered by fighter aircraft, bombers, or C-130 manned transports. The roles of these versatile UAVs could include intelligence, surveillance, and reconnaissance, signals intelligence, and electronic warfare. The Fast Lightweight Autonomy (FLA) program, now in Phase 2, aims to explore nontraditional machine-vision and autonomy methods that could empower a new class of algorithms for high-speed navigation in cluttered environments such as streets or inside buildings. FLA aims to develop and demonstrate the capability for autonomous UAVs small enough to fit through windows and fly at speeds up to 45 mph without human control or GPS guidance. 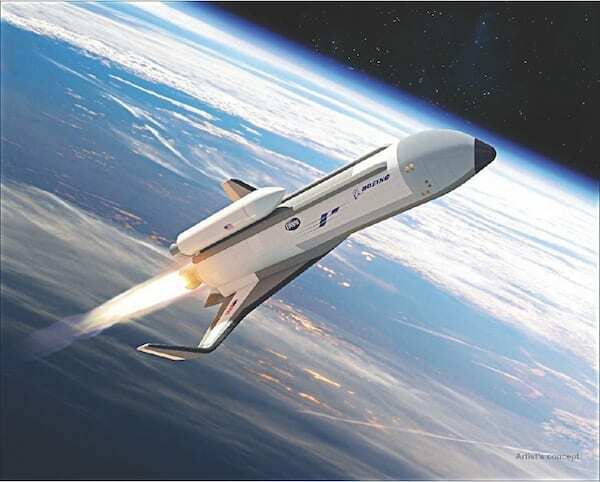 The Experimental Spaceplane program, with Boeing, aims to build and fly an entirely new class of fully reusable hypersonic craft (Mach 5 or higher) that can be launched into low Earth orbit 10 times in 10 days; reduce launch costs by 90 percent; and deploy a satellite of up to 3,000 pounds. The goal of the program is to provide the nation with an unprecedented ability to quickly recover from a catastrophic loss of critical military or commercial satellites. Automated flight-termination and other technologies for autonomous flight and operations, including some developed by DARPA’s Airborne Launch Assist Space Access (ALASA) program, are part of the program. The first test flights are scheduled for 2020. The technical tasks for achieving this kind of autonomy, Chung said, involve advances in human-robot interfaces, techniques of coding the autonomy in the software, and improving reliability throughout the system, from its chips to its mobility and other performance parameters. “On a factory floor, we can pretty much trust what robots and automated machinery do,” Chung continued. “This is not the case for something like unpiloted transport of passengers or deliveries, where we need software methods to determine and certify that the system is reliable. Part of the solution will reside in software tools for realistic simulation studies of autonomy. Historically, DARPA often has conducted research into technologies that neither are understood nor yet in demand, revisiting those same technology categories periodically as new program managers come aboard with fresh viewpoints and new developments to help move a “fringe” technology closer to being useful. Although the agency continues to pursue such research, the speed and global extent with which technology research and deployment is advancing has spurred DARPA to redouble its own signature knack for pushing the envelope without being deterred by short-term setbacks. The agency’s most coveted sign of success is when it transitions the capabilities its R&D projects support into downstream development, testing, and operational use pathways. On Jan. 30, 2018, for example, DARPA officially concluded about three years of collaborative development with the Navy by transitioning the Sea Hunter, a demonstration vessel that emerged from its Anti-Submarine Warfare (ASW) Continuous Trail Unmanned Vessel (ACTUV) program, to the Office of Naval Research (ONR). ONR now is continuing development of the revolutionary prototype vehicle, the first of what ultimately could become an entirely new class of ocean-going vessel – the Medium Displacement Unmanned Surface Vehicle (MDUSV) – that traverses thousands of miles of open seas for months at a time, without a single human crewmember aboard. Autonomy manifests itself in many ways and holds promise as an enabling framework for multiple DARPA projects. For example, robotic arms developed to service and repair orbital platforms in space also can be used for such earthbound roles as inspecting oil and gas pipelines. In airborne settings, having a broad understanding of how autonomous UAVs can expand surveillance, communications, and other facets of the battlespace opens the way to better interactions between human pilots and UAVs, perhaps leading to UAVs acting as a combat pilot’s “wingman.” That would reduce the number of manned aircraft needed on some missions and thereby remove at least some human pilots from harm’s way. Ushering autonomous UAVs into the battlespace is “not just a matter of self-reporting to the human pilots what it is doing, like a sophisticated transponder, but being able to make decision recommendations, alleviating the [pilot’s or military air traffic controller’s] responsibilities, leaving him to be a tactician or battlespace commander more effectively. That touches on a lot of what DARPA is doing,” Chung said. “On the ground, you see … Ground X-Vehicle Technologies, which are more about crew augmentation, such as instrumenting a windowless ground vehicle so the crew inside will have a better situational awareness of their environment. 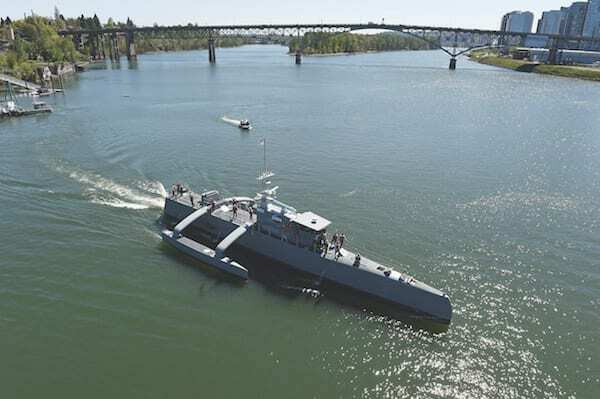 At sea, being able to maneuver, especially underwater, remains an active area for the development of autonomy options. 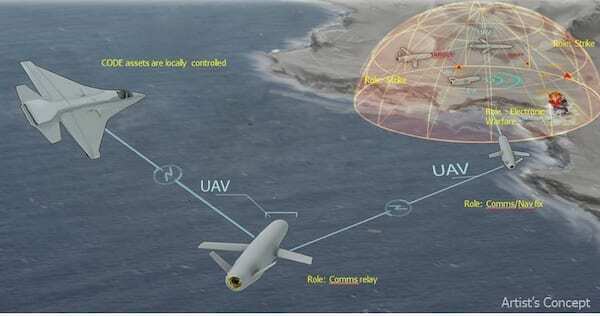 The Cross-Domain Maritime Surveillance and Targeting [CDMaST]) program, for example, is trying to better monitor and protect the waters, and part of the vision includes autonomous systems. 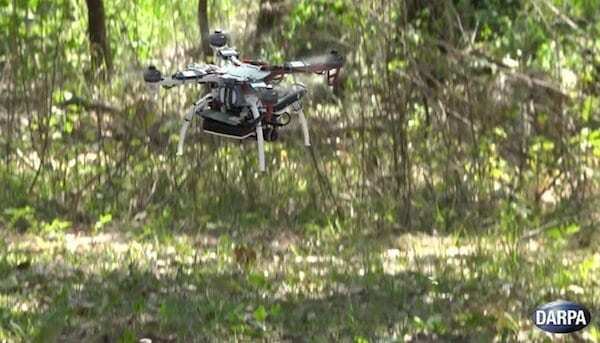 These could provide cueing to other systems – manned or unmanned – to defend and protect those areas. So a distributed network of sensors and autonomous vehicles could help shape the waterscape for maritime warfare. DARPA’s OFFSET program is all about leveraging tactical opportunities that could come with coordinating swarms of air and ground robots – up to 250 of them – in urban areas. Missions could include aiding a small unit of warfighters charged with securing a bridge, or more crucially, aiding in the historically challenging and costly task of clearing a multi-floor building of the enemy. Important to this technology vision is understanding where such swarms excel and where they don’t at all. The subterranean domain, perhaps the most unsung among all of the warfighting domains, was important in both Vietnam and Iraq. 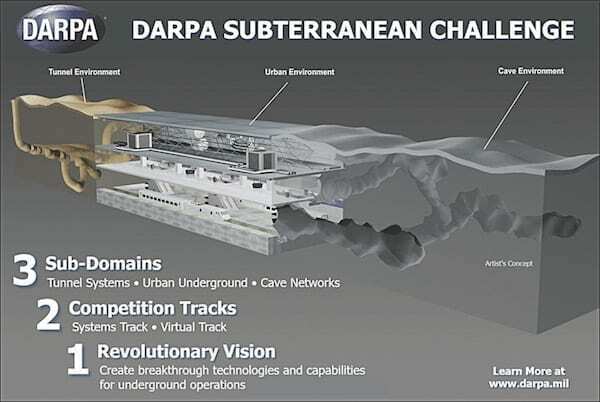 In the spirit of previous DARPA challenges, the agency has issued a Subterranean (SubT) Challenge to both accelerate an entire technology category and catalyze the formation of a research community to do just that. The capabilities the SubT Challenge calls on participants to deliver include rapidly navigating, searching, and mapping underground environments. In addition to its military applications, the potential payoffs of such technology range from finding trapped miners in a mine collapse to diagnosing specific problems in damaged storm drain systems and utility tunnels to mapping out natural caves. It will be years before any seeds of technology that emerge from the SubT Challenge can grow into actual new features of the technosphere. Perhaps the autonomous technology most frequently in the news these days is self-driving cars – both their amazing feats on the road and their accidents, some of them tragic. But while this mix of success with some failure has raised questions about whether the technology is sufficiently sophisticated and reliable to be unleashed on millions of public streets and roads, the technology’s track record has convinced Department of Defense (DOD) decision-makers that it’s ready for primetime in military applications. “The questions raised are relevant; these are issues DOD has and will continue to take seriously,” Chung said, adding that the DOD has issued directive 3000.09, providing guidance regarding what decisions autonomous vehicles can and cannot make, including ones regarding the use of potentially lethal onboard weapons. At the heart of DARPA’s autonomy portfolio are various levels of artificial intelligence (AI) – from the level of basic machine learning to that of adaptive systems to a level that is “cognizant” and can continuously learn from experience and from data it acquires on the fly. A current theme of the overall DARPA research portfolio centers on moving up the AI levels and applying these ever more capable AI systems to many technologies, including autonomy. Chung says he is excited to do his part in accelerating the rate of technology development and maturation in robotics, AI, and autonomy. Driverless cars might be one of the first ubiquitous technologies to arrive, but as he sees it, we are going to witness many more such arrivals of AI-powered robotics and autonomy.